- USD set for second-half 2019 decline as market bets on Fed cuts. - Enabling other currencies to recover from earlier punishing losses. - EUR recovery is slow, Brexit constrains GBP, AUD avoids RBA cuts. 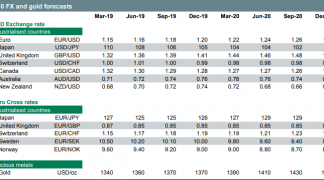 The foreign exchange market has spent much of the opening months of 2019 in a state of flux, with major currencies remaining locked within familiar ranges, but the latest forecasts from Commerzbank warn of a decisive shift in the landscape being in the cards for the months ahead. First and foremost on the minds of investors thus far is the question of what happened to the world's major economies during the opening quarter of 2019. The answer to that questions still lurks in the long grass of May and could determine the outlook for a while to come. May marks the point when most major economies will have published official estimates of first quarter growth, and markets will also have the May and then June PMI surveys to scrutinise for clues of the extent to which activity levels have changed since the early stages of the year. That question matters a lot for central bank interest rate policies across the world, but particularly in Europe and the U.S. In Europe it could be the difference between unchanged interest rates at the European Central Bank and more quantitative easing. And in the U.S. it's will be the difference between whether markets ben on Federal Reserve rate cuts for 2019 or 2020. This evolving outlook for relative central bank rate policy will be key to the trajectory of exchange rates throughout the rest of the year, after a three month period of and low volatility and range-bound trading for many currency pairs. The Dollar has been resistent to the advances of its G10 rivals so far in 2019, with the Dollar index up by around 1% thus far, but Commerzbank is looking for a second-half economic slowdown to prompt increased speculation of Federal Reserve rate cuts for 2020. That would be likely to be the undoing of the U.S. Dollar as well as the beginning of a strong recovery for the Euro, Pound and some other currencies. Below is a selection of Commerzbank's views on what this environment is likely to mean for individual exchange rates. The Dollar index was -0.12% lower at 96.94 Tuesday but up 0.95% for 2019, while the Pound was -0.19% lower at 1.3038 against the Dollar but is up 2.34% this year. The Euro was up 0.18% at 1.1277 but is down -1.65% for 2019. "The pound is trading at surprisingly strong levels. This may be due to the fact that most market participants still consider a postponement very likely – not least because the British House of Commons has clearly spoken out against a no-deal Brexit." "We also think it is very likely that the Brexit will be postponed once again. The pound should then appreciate. In the event of a no-deal Brexit, however, a significant depreciation is to be expected. However, this could materialize in different ways, depending on how and when the no-deal Brexit would be announced." "In this situation, the significance of our point forecasts is significantly reduced. The ECB's more cautious stance (we see no interest rate hikes throughout the forecast horizon), however, contributes to lower EUR-GBP levels. On the other hand, the USD weakness we expect at the end of the Fed's cycle of interest rate hikes suggests that GBP-USD levels will tend to be higher. However, both would hardly slow a GBP downward correction if a no-dealBrexit were to return to the agenda, contrary to all expectations. We will update our currency outlook at the end of this week." "The US economy is also cooling noticeably. The question is only: is this a cyclical downturn or just a return to normal growth rates after the artificial kick of tax reform comes to an end? Our US economists expect strong growth in Q2/2019 – which should then dispel the slowdown concerns. And yet they do not expect the Fed to hike its key rate again. On the contrary. For 2020 they already have an interest rate cut on their forecast slips – although from their point of view GDP growth is likely to fall to just under 2% towards the potential growth rate." "The dollar is still the G10 currency with the highest carry. This protects against rapid depreciation – even in times when the Fed switches from “interest rate hike” to “interest rate cut”. Nevertheless, the dollar has been fundamentally “expensive” for some time now (more precisely, since the Fed's first steps towards normalization were gradually foreseeable) The fact that this situation lasted so long is certainly due to the rising expectations of the future carry advantage of the dollar. Actually, as soon as it can no longer be expected that the carry advantage will continue to expand (i.e. as soon as the Fed's expectations turned around), the dollar should slowly give way." "In our opinion, there is one main reason why this has not happened so far: fear of a global recession. The 2008 experience should teach many market participants that USD long positions are one of the few insurances the market has to offer." "For a long time, the prospect of a first ECB interest rate hike and the associated (perhaps always false?) hope of normalization had a positive effect on the EUR. The fact that the time of the first rate hike had to be regularly postponed into the future did not matter." "The hope for normalization was the carrot that the ECB kept in front of the market’s nose. And the market pursued the unattainable like a donkey. That has changed qualitatively. If the carrot dangles too far away from the donkey's nose, it no longer chases it. The euro lacks an important factor that has supported it so far." "As soon as it can no longer be expected that the carry advantage will continue to expand (i.e. as soon as the Fed's expectations turned around), the dollar should slowly give way. In our opinion, there is one main reason why this has not happened so far: fear of a global recession. The 2008 experience should teach many market participants that USD long positions are one of the few insurances the market has to offer." "If this fear eases (e.g. because the global recession is flat), the demand for such insurance should also decline and the dollar should weaken. Not dramatically, but gradually. We therefore expect EUR-USD to be noticeably higher at the end of 2019, but not dramatically higher. We consider EUR-USD rates of 1.20 to be probable for the end of the year." "The recovery of the Australian economy and thus of the AUD will depend largely on the extent to which concerns about the Chinese economy prove to be true." "In general, however, we are optimistic that there will not be a noticeable slump in Chinese economic growth. Those responsible in Beijing have already reacted to the weaker momentum and initiated both monetary and fiscal stimulus measures to support the economy. We therefore expect the economy to stabilize in the coming months. This should significantly dampen speculation about interest rate cuts in Australia, after which the Australian dollar should recover." "We forecast a recovery of the Australian currency, especially against the US dollar, which is however primarily attributable to a weak greenback rather than a strong AUD. Since the US Federal Reserve is unlikely to raise its key interest rate any further, the US dollar appears overpriced and should therefore depreciate in the course of the year." "We do not believe that interest rate cuts by the RBA will be necessary. However, like other central banks, it will maintain a cautious stance in view of global economic concerns and maintain its low interest rates for the remainder of this year. We therefore do not expect monetary policy to provide any significant impetus for AUD exchange rates in the medium to long term. "We have considerable doubts that the BoC will continue to raise interest rates, given that the Fed made a significant change of course at the beginning of the year. Our US experts now see a higher probability that the Fed's next interest rate move will be a cut, rather than a hike. The end of the US rate hike cycle should weigh heavily on the US dollar, which is why we expect the Canadian dollar to appreciate against the US currency." "As the BoC is also highly likely to abandon its normalization plan in order not to diverge significantly from the Fed's monetary policy, the CAD is unlikely to gain too strongly though. Moreover, since the Canadian currency does not appear to be as overpriced as the US dollar, the US dollar correction should ultimately be the dominant driver in USD-CAD." "The market has already priced out interest rate hikes by the BoC and now sees a greater chance for interest rate cuts, as it does for the Fed. It is true that the BoC is indeed likely to abandon its normalisation plans. However, economic growth is unlikely to slow to such an extent that the BoC will have to resort to a loosening of monetary policy. This should limit the depreciation potential of CAD."